Is pipe smoking becoming cool again? Pipe smoking, for many it was what your granddad or great granddad used to smoke. Pushing tobacco into the bowl and lighting it with a match and you would watch them puff away on their pipes. More familiar with images on TV from old movies or in books than in everyday life now pipes are synonymous with people from the history books. But is pipe smoking becoming cool again, just like hipster type glasses, we are seeing a resurgence in pipe smoking. Whether its traditional Sherlock Holmes type pipe or modern glass pipes it’s a new craze that’s hitting the streets and all the cool kids are doing! Pipe smoking isn’t just restricted to tobacco, you can smoke a number of herbal tobacco alternatives which come in a range of delicious flavours. So you don’t have to be hooked on tobacco to enjoy pipe smoking there are healthy way to go about it. Here at Shivaonline we stock an extensive range of Smoking Pipes & Chillums, ideal whether you’re just starting out smoking or looking to add to your collection we have something for everyone. And now as smoking pipes are seeing a resurgence because people look to change their smoking habits, you can enjoy smoking with tobacco, molasses and herbal smoking mixtures all of which we also stock as well as pipe and chillum smoking related accessories. Our huge range covers Traditional style Brass Pipes and Wooden Pipes are if you want to go for an old school classic look. Our Brass Pipes come in unique designs and are fairly priced, from an affordable £5.99 to a more expensive £49.99 for a deluxe Brass Smoking Pipe. You will stand out from the crowd with these. For those preferring something more natural then we do have a great collection of Wooden Pipes in over 60 different and unique carved designs. Our Wooden Smoking pipes are much more affordable and a wonderful addition to any collection as well as our hand carved Indian Chillums. The Chillums exotic designs are a great talking piece as well as the accessories which go with them. You can also choose from modern Aluminium Pipes and Steele Pipes which are easy to clean and durable. There are a number of different styles to choose from and many come in a wonderful range of bright colours. And for those on the go we also have travel pipes so you can take your pipe and smoke it anywhere (within the law). If you’re looking for a gift for an avid pipe smoker or pipe smoking fan then we can also help you here. Our classic Sherlock Holms Pipes or fun and funky Cannabuds & Funguys pipes are great collector’s pieces and make perfect gifts. A pipe or a chillum? The choice is yours with the 2 Way Shiva Pipe. This ingenious pipe can be disassembled and reassembled as a regular pipe or a chillum and gives you the best of both worlds. 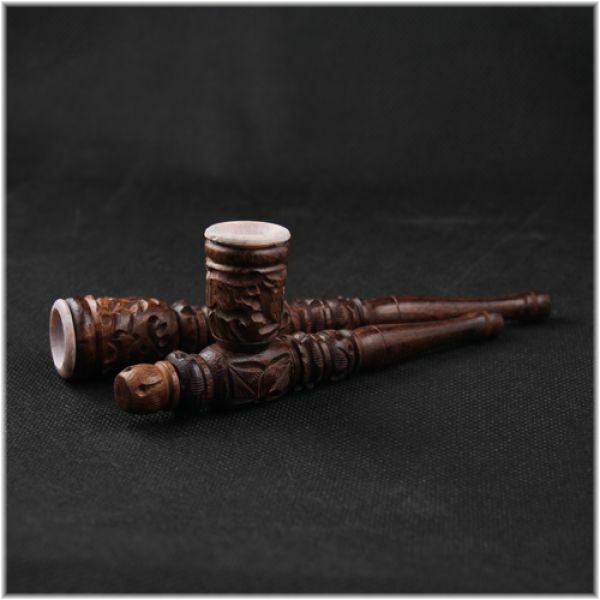 The 2 Way Shiva Pipe is hand carved in India from the finest darkwood and is engraved with an exquisite floral design. Available in small, medium and large sizes this pipe is easily swapped over depending on how you want to smoke. Please note: this item is hand carved so the colour and pattern may vary slightly from the picture below. The 2 Way Shiva Pipe is available from just £6.99 and pipe screens are available here. Chillums have been used for smoking in India for hundreds of years and is closely linked to spiritual rituals. Here at Shiva Head Shop all of our traditional clay chillums are handmade and each one comes with its own filter stone, meaning that you don’t need any pipe screens. Using a chillum is easy; hold the chillum upright and create an airtight fist around the end of the pipe. Inhale through your hand and not directly through the pipe as it becomes really hot. You can also use a damp cloth around the base of the chillum to act as an extra filter and to stop the end from getting too hot. As our clay chillums are handmade, there may be some differences in colour and design from those pictured. Spare filter stones are available here. 2-Way Tantra Pipe – choose the way you smoke! The 2-Way Tantra Pipe is the best of both world’s; not only can it be used as a standard pipe, it can also be converted into a chillum, great! This beautifully hand crafted pipe comes complete with a smooth, soapstone bowl and has a very traditional look. To change the 2-Way Tantra Pipe into a chillum simply, unscrew the notch on the end and the pipe bowl and swap them over, simple! It is recommended that you use pipe screen with this pipe to minimise debris going into your mouth. The 2-Way Tantra Pipe is available now for just £6.99 and is a great accessory for any pipe smoker. Elephant Chillum – a traditional way to smoke! The Chillum has been used as a smoking method for hundreds of years and originated in India; it is often used during spiritual gatherings and is a great way to enjoy your herbal blends. Each Elephant Chillum comes complete with a filter stone so no screens are necessary. To use a chillum simply hold it upright and make an airtight fist around the base and inhale through your hand; do not put your mouth directly onto the chillum as it becomes quite hot. A damp silk cloth around the base also acts as an extra filter providing a smoother smoke. The Elephant Chillum is handmade so it may vary in colour and design of the picture below. The Elephant Chillum is available now from £8.90 and is a great assessor for your smoking arsenal. The 2-Way Tantra Pipe is great for those who want to mix things up when smoking their favourite herbs. The pipe can be set up in two ways, either as a standard pipe or as a chillum. It is hand carved and also features a sandstone bowl that will withstand years of regular use. To change the orientation of the 2-Way Tantra Pipe simply unscrew the bowl and notch and swap them over; unscrewing the pipe also makes it easier to clean to keep it in tip top condition. The 2-Wya Tantra Pipe is available in small or large sizes and are just £5.99 and £6.99 respectively. It is recommended that you use pipe screens with this pipe. Why not check out Shiva Head Shops range of herbal blends, a perfect complement to the 2-Way Tantra pipe. Chillums have been used as a traditional method of smoking in India for hundreds of years, so why not give it a try today! The Grey Sun Chillum is a medium sized chillum and comes complete with a filter stone, so you don’t need any pipe screens. The Grey Sun Chillum is handmade, so colour and designs may vary slightly; it is available now from Shiva Head Shop for just £8.99, bargain! To use a chillum, hold it upright and make an airtight fist around the base, next light and inhale through your hand; do not inhale with your mouth directly on the chillum as it is hot. You can also use a damp cloth around the base to stop the chillum from getting too hot. Easter Island Chillum – for a traditional smoke! A Chillum is a traditional smoking pipe that that has been used in India for hundreds of years and is closely linked to spiritual rituals. The Easter Island Chillum is handmade out of clay to resemble the famous Moai statues on Easter Island. Each Easter Island Chillum comes with its own filter stone, so there is no need to use pipe screens with these pipes. To use a chillum hold it upright and make an airtight fist around the base of the pipe, then inhale through your hand. Do not put the chillum directly onto your lips as it gets really hot. Because the Easter Island Chillums are handmade, there may be subtle differences such as the colour or design from the picture below. The Easter Island Chillum is available now from Shiva for just £7.99, bargain! The 2-Way Soapstone Pipe is a great addition to your smoking accessories and can be used as a standard pipe or a chillum; it has intricate carvings along the body and bowl that will make it stand out from the crowd and has a sturdy and natural feel. The notch on the end of the 2-Way Soapstone Pipe can be unscrewed to reveal an extra hole that can be used as a short hole for an instant hit or you can screw the pipe bowl onto it to create a chillum. This pipe measures around 12cms long, which makes it perfect for home use or when you’re out and about. It is recommended that you use 20mm brass pipe screens with this pipe; the brass is better for the soapstone as it will not mark it. Please note: because soapstone is a natural substance colours may vary slightly from the picture.